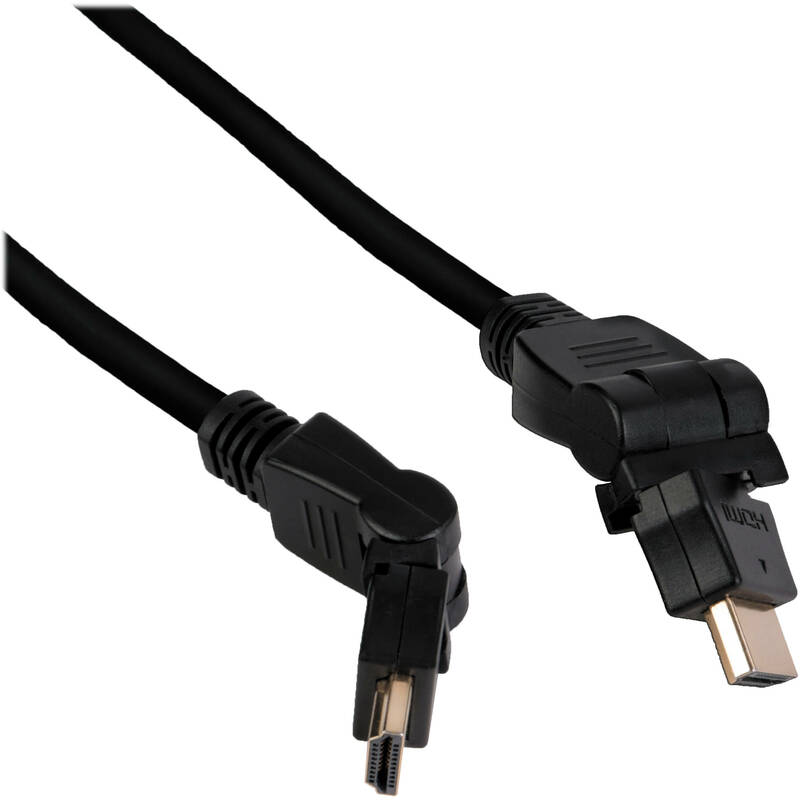 The 1.5' Pearstone Swiveling HDMI Type A Male to Type A Male Cable is a high performance cable ideal for HDTV, DVD/Blu-ray players and cable and satellite boxes. It features two swiveling gold-plated HDMI type A male connectors, which can be rotated 180-degrees either horizontally or vertically. This reduces strain on the cable and allows it to be attached in various orientations. It's ideal for running cables at different angles and installations in cramped spaces. This cable also allows you to benefit from advanced HDMI technology since it supports an HDMI Ethernet Channel, Full HD video, 3D and ultra-high 4K resolution. Box Dimensions (LxWxH) 7.5 x 6.9 x 0.9"
1.5' Swiveling HDMI Type A Male to Type A Male Cable is rated 4.9 out of 5 by 8. Rated 5 out of 5 by Benjamin from Flexible I use this cable to connect my external monitor to my DSLR video camera. I like that the connectors swivel and bend, allowing a more flexible connection. It feels durable too. Rated 5 out of 5 by Jerel from Great cable My new tv had a very awkwardly placed hdmi port in a recessed compartment. It put a real strain on the cable whih had to bend at almost a right angle to be inserted. I didn't see that as being good for the cable or the port. This nifty device took care of that problem. Works well. Rated 5 out of 5 by Merchant from Perfect HDMI Cable for 7 Monitors I picked up a couple of these cables from B&H for my 7 on-camera monitors. Being able to bend the cable right where they come out of the camera and monitor makes the cable run nice and neat, and doesn't put any stress on the ports. They work great and are a great value. Rated 5 out of 5 by Marc-Alexandre from Great HDMI cable, built to last! The cable is well built and don't feel cheap at all. The swivel connections are very nice and comes in handy on the field when using monitors that aren't always placed in the right angle! RECOMMENDED accessory for anyone who want a good cable, without breaking the bank. Rated 5 out of 5 by Tomasz from Perfect Compact, short and very versitile. Exactly what I was looking for. Rated 5 out of 5 by Judy M. from Good Piece Perfect size for my needs. To connect my monitor to my camera. Rated 5 out of 5 by Edward from Works as expected. Works as expected. I should've ordered a longer cable though. Rated 4 out of 5 by goro from works well nice HDMI. swivel is nice feature.